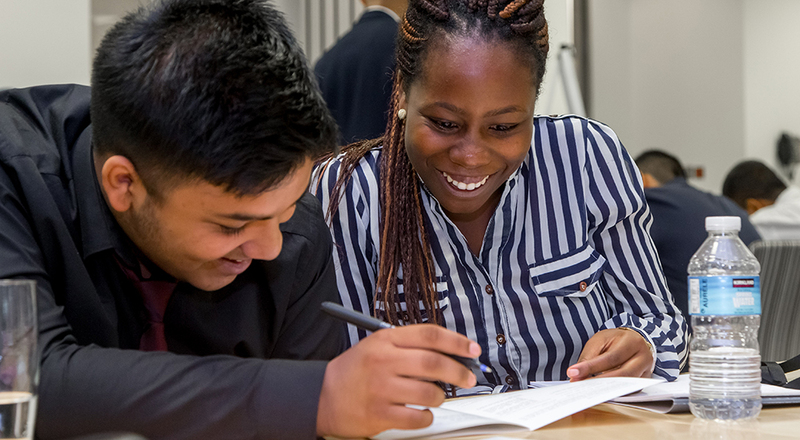 Every year, Tower Hamlets Education Business Partnership works with around 2,500 students to help them find meaningful and worthwhile work experience placements. We place students in a whole range of sectors, from retail to finance, from education to graphic design. We encourage students to focus on the transferrable skills they can develop in any workplace, no matter what their chosen future career may be. We arranged for Shahla Corbett, a Year 10 student from Morpeth School in Bethnal Green, who undertook a week-long work experience placement at Bouygues UK, one of the country’s leading construction firms. Shahla was based just around the corner from her school, on site at one of the firm’s flagship developments, the new Graduate Centre being delivered on behalf of Queen Mary University of London, on their Mile End Road campus. Shahla’s interest in engineering was sparked during a Year 9 “Meet the Professionals” careers event at school, run by us where she had the opportunity to take part in a construction engineering workshop. She enjoyed the tasks she was set enormously and her keen eye for precision and design was noted by Bouygues UK, which was taking part in the workshop. Owing to the school’s working relationship with Bouygues, for the past few years they have managed to secure a work experience placement for a Year 10 student – this time the lucky student was Shahla.